I’ll be exhibiting ISS-Above at the San Diego Maker Faire on December 7th. If you live anywhere in SoCal I highly recommend attending. 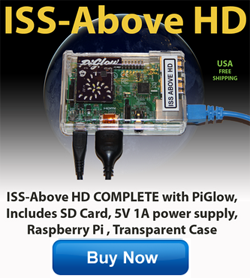 If you buy a basic Raspberry Pi Kit with the needed add-on display device (I recommend the Pi-Glow to get started) and an SD card and bring it along… I’ll install the current beta version of ISS-Above on it and get it working for you.